Growing old can be a celebration! It should be the time we celebrate our lives, to reminisce our triumphs and most importantly, to spend more time with family. However, old age also poses health issues and long-term care planning becomes a must for most households with an elderly individual. Please call us at 703-221-4854 to schedule an assessment. Our registered nurse will visit you at home for a consultation which will be followed by the nurse’s assessment and evaluation. 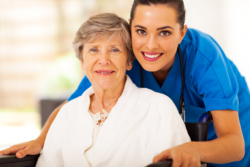 This will determine your eligibility for home care.